I’m pretty busy with work right now. I’ve set myself on the path towards my next credential, which means I’m doing a lot of thinking and reading about work related topics on my own time. I have literally purchased myself a stack of books on this new topic and one of them has a title or subtitle regarding “learning to see”. The notion of learning to see resonates with me. There is something about its zen nature… You must unlearn what you have learned; you must train your mind; there is no try there is only do or do not… there are poetic underpinnings lurking beneath this phrase that imbue it with a profound resonance. Like my entry art and poetic snap-shot, below is another camera phone shot of something that captured my eye. I wonder what it is about this scene that caught my attention? 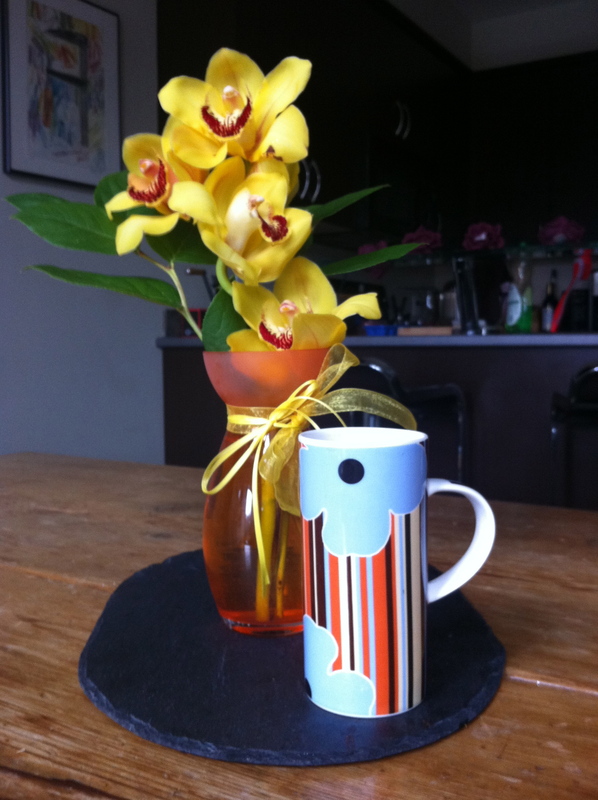 Is it the harmony between the coffee cup, orchid and artwork? Is there some aesthetic mystery embedded in this triptych? Or am I finding more beauty in everyday things because I’m slowly learning to see? I am an enthusiastic convert – I subscribe to Sir Ken Robinson’s updated Jungian view that by people pursuing their passion(s), or being in their Element, there is a transformative effect on the individual and thereby society as a whole. Exploring-Art.com was my manifestation of To-Fu’s creativity rule number 24, Create a Framework, this blog is my framework. My Element? Perhaps I have discovered my Element via continuing education in the fine arts, and it is my word for 2012, to: Write. So to be my most creative, my most contributory I need to write more… I think I have that much right, but there is something I got wrong and reading The Happiness Project brought it to my attention. I have professed that enthusiasm is a renewable resource. Trees are also a renewable resource; however, we need to plant more trees or we will run out. Renewable does not mean inexhaustible. So what’s my point? By focusing my goals on exploring art, and cultivating my Element, I skipped an imperative foundational step. To illustrate this point and also that I learned something during my Undergraduate Degree, let us talk about Maslow’s Hierarchy of Needs. 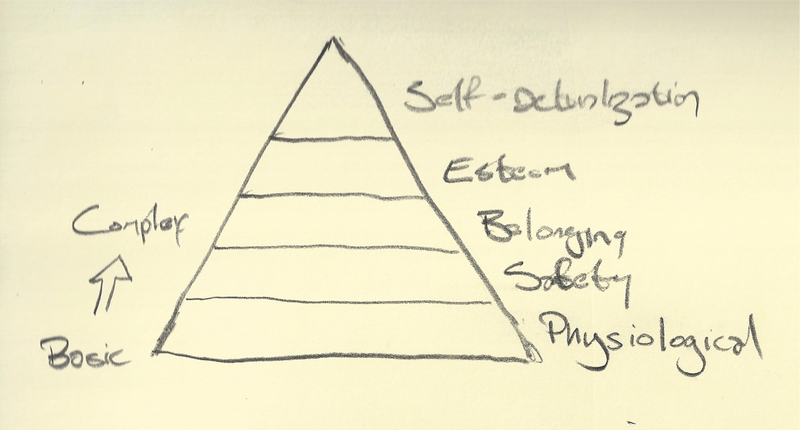 Okay so that might seem a little abstract, so here is how I would map that hierarchy to categories more meaningful to me and my situation, from foundational to inspirational, Vitality, Family, and the Element. My resolutions for 2012, both the SMART goals and the poetry were backwards! I can’t just focus on my Element and have the foundation piece as minor side notes. I need to ensure my foundations are well placed so that I can pursue my Element, my atmosphere of growth, as Gretchen Rubin would call it, without the looming spectre of exhaustion. My enthusiasm is a renewable resource, but it is not inexhaustible. I must first commit to myself and my family in order to succeed with my loftier goals. More to come on what that means soon.